This product is brought to you by Live Cell Research, a health and wellness company with business interests in the diet and supplementation niche. The company’s product development program is backed by an intensive R&D effort and, in fact, the company has as its pillar, the requirement of a convincing scientific research when formulating its products. In addition, the company also guarantees that all of its products undergo a rigorous third-party evaluation prior to market distribution. Niagen — Does It Really Work? Improve cellular level coordination and communication to enhance repairs, rejuvenation and renewal. Support your skin in better coping with repairs necessary to keep cellular integrity intact. Promote healthier and re-energized cells. What Are The Ingredients In Niagen? Nicotinamide Riboside: Enhances the health and functioning of your brain, improves cellular energy levels to keep your system revitalized, promotes better cellular level protection against the permanently damaging effects of free radicals. Take 1 pill of Live Cell Research Niagen daily at about the same time of day or night. If you are on regular medication or suffer from a medical condition, consult with your specialist before taking Niagen. Presently, Live Cell Research Niagen is the only oral supplement capable of delivering NAD+, a cellular component found to help inhibit cellular degradation and prevent premature aging. This product is vegetarian, gluten-free and does not contain toxic preservatives. The product increased energy, restful sleep, physical stamina and sharpness. Although many user reviews say it isn’t very effective. There is no guarantee that this product will work for you, as is the case when orally supplementing. This product has a limited distribution network. Live Cell Research Niagen reviews are severely limited and currently do not provide a fair gauge of how users are responding to this product’s claims and effects. This product may increase blood pressure. It is not a very well known supplement brand. Does Niagen Have Any Side Effects? Given the ingredients and based on available user reviews, side effects may be experienced when using Live Cell Research Niagen depending on your unique sensitivities. 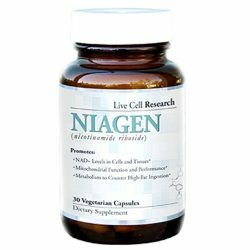 Live Cell Research Niagen has but one very specific offer which is NAD+. In some ways it is good but, your satisfaction and fulfillment with this product will only be as good as whether or not your body needs this kind of supplementation at all. Whether or not you decide to be on Niagen, living a healthy lifestyle remains to be the key factor that helps you prevent premature aging.